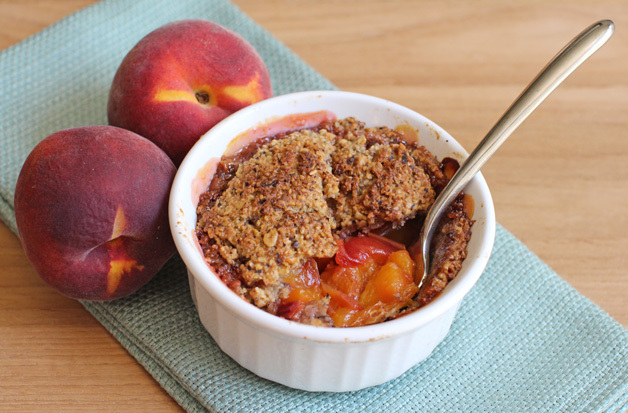 It’s summertime, peaches are in season, and you want a little something sweet to get you through the afternoon, or to make the perfect ending to a light dinner. This is it. 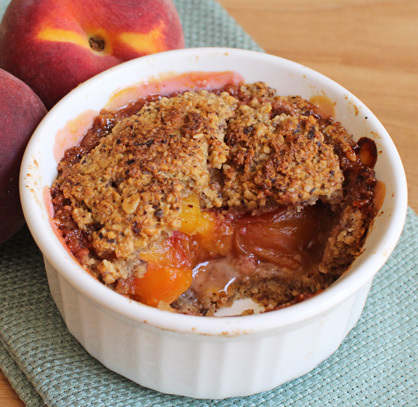 Peach Pie for One, baked in an individual-sized ramekin – in the toaster oven, no less (no need to make the kitchen any hotter than necessary, this time of year) – is not only delicious, it’s amusingly reminiscent of childhood afternoons spent sliding miniature chocolate cakes into an EasyBake Oven. 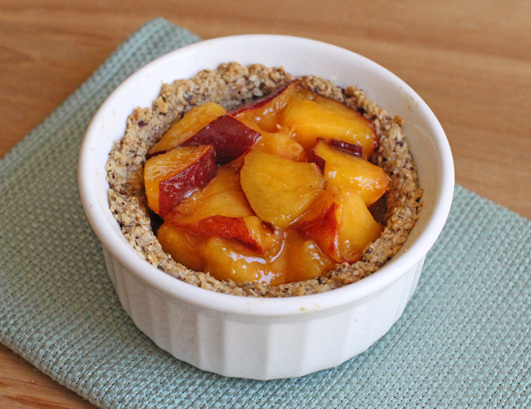 This pie is gluten-free and low in sugar, too, since the peaches lend their juicy sweetness to the dessert. It’s healthy enough that you can glare in mock anger at your little ramekin full of deliciousness and snarl, “I eat pies like you for breakfast,” without the slightest hint of remorse. 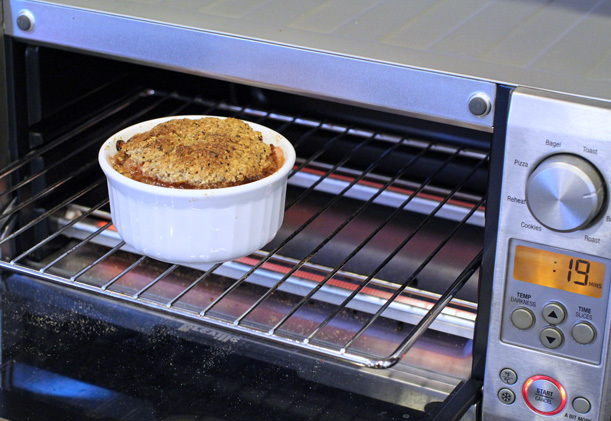 Lightly oil an individual-sized ramekin with coconut oil and preheat your toaster oven (or regular oven) to 375°F. Choose your ripest peach. You can tell when a peach is ripe, because it smells very peachy even from about a foot away, and is still slightly soft, but mostly firm to the touch. Chop the peach, transfer to a small bowl, stir in the maple sugar and lemon juice, and set aside to allow the peaches to start to form a syrup. Roughly pulse the rolled oats in a food processor, or even easier, a Magic Bullet blender. The oat flour can be coarse for this recipe. Transfer the oats to a bowl. Add the hazelnut meal to the oats, as well as the maple syrup, vanilla extract, sea salt and coconut oil. Stir and smash the mixture with a fork until it appears to be uniformly mixed. 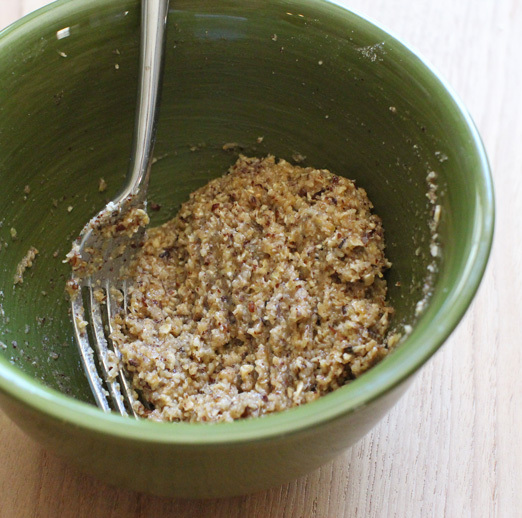 Add the flax seed + water mixture and stir again until thoroughly combined. Press three-quarters of the mixture into the bottom and all the way up the sides of your greased ramekin, saving the last quarter for later. Slide the crust into the oven and pre-bake it for 10 minutes. Carefully remove the ramekin from the oven. Don’t forget that it will be hot: Always handle it with potholders and set it on a cloth napkin or trivet on top of your work surface. 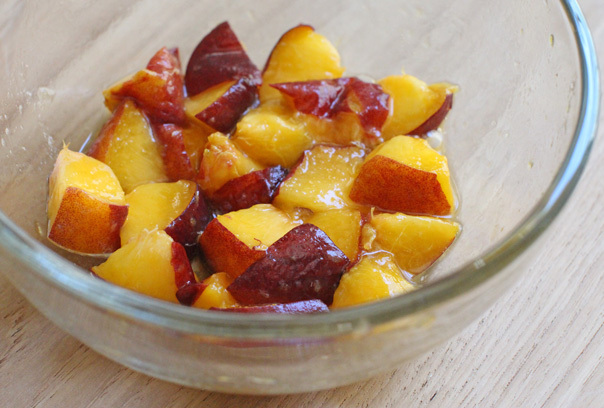 Spoon the macerated peaches into the pre-baked crust. 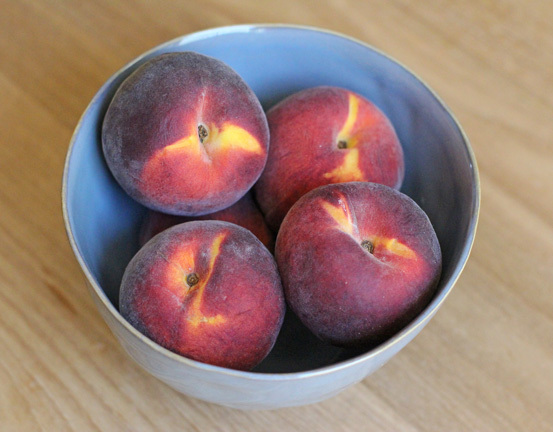 Take the rest of the dough into your hands and form it into a thin disc about the same diameter as the ramekin, and then carefully lay it on top of the peaches. Place the pie back in the oven and bake it for 25-30 minutes. 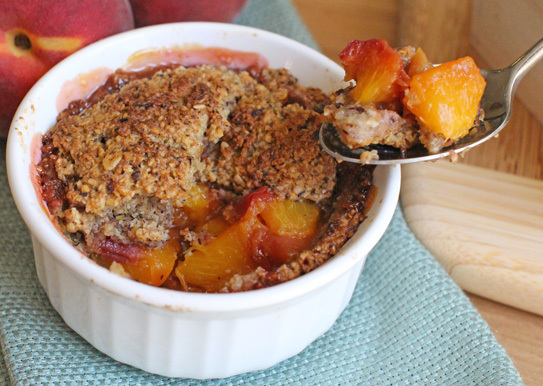 When you remove it, the crust should be browning and the peaches bubbling. Allow your pie to cool until it’s just warm and ready to eat. Then you can scoop it directly into your pie hole with a spoon. This is the beauty of single-serving desserts! This would be excellent topped with some vegan vanilla ice cream or a pour of homemade almond milk, but is wonderful just as it is. If you want to save it for later, store it covered in the fridge until you’re ready to partake. 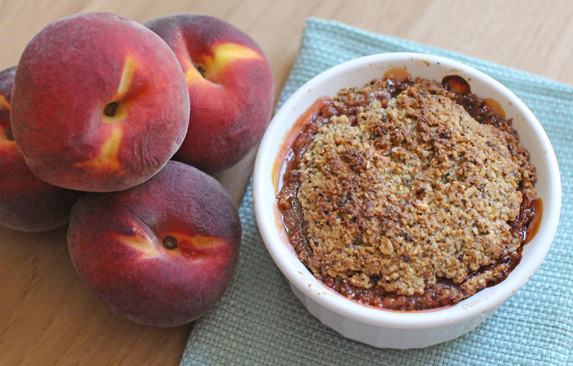 6 Responses to "Peach Pie for One"
Oooh, I want to try this. I could def use a healthy pie-for-one for breakfast, and it looks so good! Love that you made it in the toaster oven. Thanks so much for the idea!! That is yum in a bowl. I love how it is perfectly portioned.